The now-popular images of a young Ayush Khedekar and Rubina Ali masterfully portraying a tale of life in Danny Boyle’s “Slumdog Millionaire” with a backdrop of a society wanting of basic lifestyle facilities outlines the general perception of slums. Owing to a particularly biased representation in popular culture, slums, to a general urban citizen seems to be the squalid expanses of cramped households interlaced with open gutters, a frequent fetid collection of household wastes and, not surprisingly, acting as the cradle of crime kingpins. Though true to a great extent, this tendentious version of the picture overlooks the untapped potential of the slums, buried as a result of social negligence and improper understanding of their economic impacts. They are usually a considerably large collection of cramped households either located at the peripheral fringes of an expanding urban settlement or present encroaching unclaimed lands adjacent to a heavily industrialized zone, in exception of some slums found at the heart of major urban dwellings. A primitive rural household might also lack the modern sanitation facilities and durable dwellings characteristic of a slum household, but their distinction from the classical slums can be made primarily from the absence of overcrowded livelihoods and an absence of general sanitary environment highly conducive to diseases. Moreover, slums are a by-product of rapid expansion of cities and their existence is invariably accompanied by an adjacent foci of urbanization. Why do slums almost inevitably accompany urban growth? This is a perplexing question to ponder upon. There seems to be some factors which are neglected, primarily as a consequence of the ignorance of city planners, which result in the unalienable development of slums accompanying urban expansion. Predominantly a manifestation of mismanaged urban planning, this phenomenon is a direct result of the fact that most urbanization endeavors cater to the people belonging to a particular economic tier, and hence the future slum-dwellers, not provided with a profitable settlement opportunity, are forced to settle in socially alienated households in regions not already recruited for the urbanization venture. Hence, the slums are born alongside rapid urbanization as the manifestation of the fact that a non-sustainable model of development was incorporated, wherein the lower economic tiers of the society are not involved into the modernization process depriving them of a chance of a livelihood upheaval. The success of integrated development strategies where the people indigenous to the region undergoing development are allocated their share of the resultant profits, point to the need of an urbanization model which includes benefits to all sections of the society and includes active participation of the section more prone to form the majority of a slum population. Although slums are functionally secluded from the adjacent urban society, the Darwinian lifestyle, which strongly supports the classical dictum of “the survival of the fittest”, makes the social scenario of slums not so different from the urban counterpart. The major social impact of slums on our global society can be assessed under two headings, the social implication in the personal life of an individual living in the slums, and the implications on the society outside slums. For the people living in slums, the economically stressed social environment greatly undermines their potential to participate in normal social activities. When getting food daily is a concern, healthy social interactions in form of regular meets, functions and the like, are hardly on their priorities. As a result, there is an absence of social consolidation, which later gives birth to anti-social activities, transgression of the law and a failure to abide by societal ethics. As long as the slum-dwelling-population remains socially destitute, the breeding of unlawfulness in the bellies of most slums becomes an unavoidable occurrence. Considering the impact of slums on the urban society outside the slums, the biased mental image of slums takes a pivotal role. This socially secludes the slum population into developing a society of their own, practically free from the outside world. Jobs are a way of connecting these two groups of people, but, as a courtesy of a prejudiced representation in popular culture, people outside slums are oblivious to the prospect of finding professional skills from within the slum population and are blind to the fact that socially involving these people via their participation in the outside society is the cornerstone of a sustainable urban growth. A fact confirmed by simple internet exploration, the number of successful people and celebrities to have come up from slums is far outweighed by the number coming up from rural and economically stressed backgrounds, despite both these settings having equal economic strain. This is a visible effect of the social negligence of slums. Overpopulation due to lack of awareness of its dire consequences has its roots in such settings. Slums are characterized by squalid surroundings. 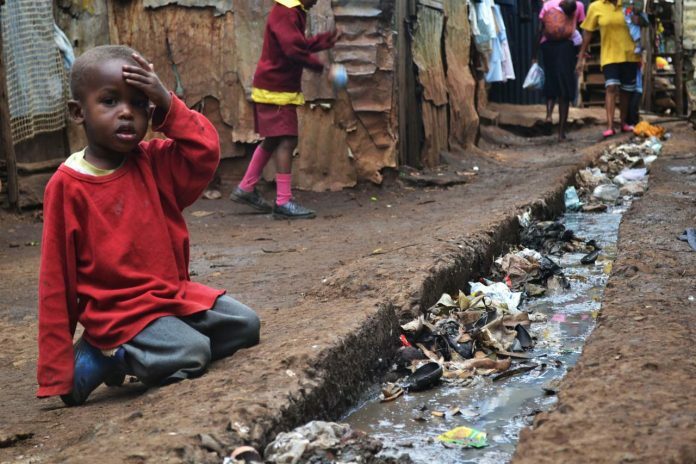 Open gutters, absence of underground sanitary conduits, frequent waste dumps and an almost total absence of medical facilities make slums conducive to breeding of diseases. The incidence of diseases and the resultant mortality is atleast two-fold higher than the corresponding statistics of an average urban setting. Pre- or post-natal care is practically absent. Healthcare standards are worsened by their social alienation which makes it difficult to reach out to this population, even through sizeable endeavors of the adjacent healthcare establishments. The need of incorporating healthcare measures into slums is more critical than the need of their economic upliftment. One of the most important factors, and also the most frequently overlooked factor by most, is the presence of latent potential in the population inhabiting slums. The broad principle of equal genetic potential of all populations of a common ancestral origin shows how science backs the idea that slums may be wanting everyday facilities, but they are not wanting in skills and talent. It is the absence of opportunities of expression which downs the outflow of talent from these sections of society. The only sustainable model of urban growth which does not alienate pockets of populations in slums, is the one which involves active participation of this section of society at the front of development. This untapped reservoir of skills and manpower, if rightly channeled, can drive the frontiers of development to unforeseen heights of urban growth. When the tribes in forests undergoing consolidation under government schemes clashed with the government personnel, the novel idea of joint forest management (JFM) was born wherein indigenous participation was the cornerstone of the undertaking. This model of sustainable development is the exact same model that needs to be implemented in the scenario of urban growth. “From the equality of rights springs identity of our highest interests; you cannot subvert your neighbor’s rights without striking a dangerous blow at your own”.